Following poor results for the ruling Grand National Party in Wednesday’s by-elections, the party’s leaders resolved Thursday to resign en masse and form an emergency panel next week. “We fully realize our responsibility for the given results and shall accept the people’s message,” said leader Ahn Sang-soo at a senior lawmakers’ meeting early Thursday. The GNP made the announcement after losing most of the seats up for grabs. In the crucial Bundang-B constituency, the party’s candidate Kang Jae-sup lost to main opposition Democratic Party leader Sohn Hak-kyu, brightening Sohn’s prospects for the presidential race next year. Though GNP candidate Kim Tae-ho won in the Gimhae constituency, the party’s general performance was regarded as a humiliating defeat. “The only way for the party to regain the people’s trust now is through a complete overhaul both in terms of intra-party structure and attitude,” Ahn said. An in-party election will be held next Monday to select the new floor leader, after which an emergency committee is to kick off, according to the party’s spokesperson. This was the second massive resignation of the party’s leaders since the local elections last June, in which the GNP lost most of its district council and administrator seats to the opposition camp. Wednesday’s by-elections may have a greater impact for the ruling party, however, as the general and presidential elections are nearing. It is expected that next week’s launch of the emergency panel will soon be followed by a party convention to select a new leader and supreme council members, who will then line up the party candidates for next year’s general elections. Key party members have agreed that the panel should be chaired by a relatively neutral person, who is to refrain from political power games, according to officials. Also, the chairperson will be excluded from the party floor leader candidacy, in order to secure intra-party balance and the independence of the emergency panel. Amid the changes, high-ranking veteran lawmakers and young star lawmakers are expected to compete for the party leadership. 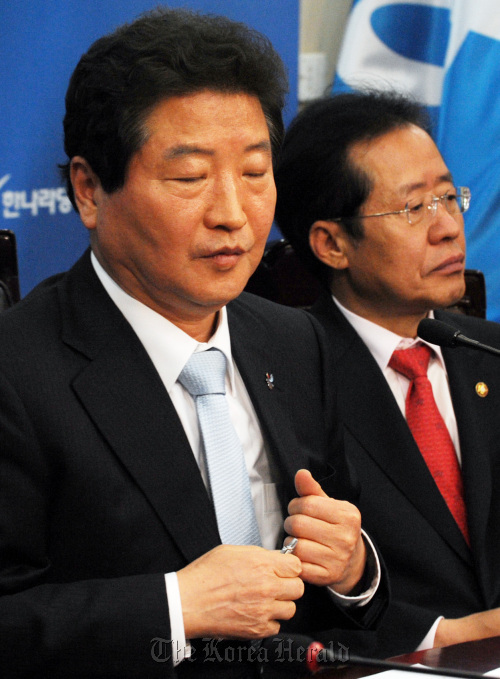 Special Affairs Minister Lee Jae-oh has declined to run for the party leadership. Other prominent lawmakers including current floor leader Kim Moo-sung and supreme council member Hong Joon-pyo have been mentioned as plausible candidates. Alternatively, younger lawmakers may emerge as possible leaders capable of rebuilding the party after the recent setbacks. Rep. Nam Kyung-pil and other relatively junior lawmakers such as Chung Doo-un, Won Hee-ryong and Na Kyung-won are considered to be plausible options. A meeting of first-time lawmakers also held an emergency meeting on Thursday morning in response to the situation and to seek ways to reform the party fundamentally. They also demanded that the floor leader election be delayed by a week, arguing the issue needs further in-depth discussion first.